The bookshelf speaker market is hugely competitive, with hundreds of companies putting out everything from tiny wireless wonders to huge monoliths that shade the line between bookshelf and tower speakers. Audioengine are one of the few who have remained totally consistent, creating models that remain relevant years after they drop. 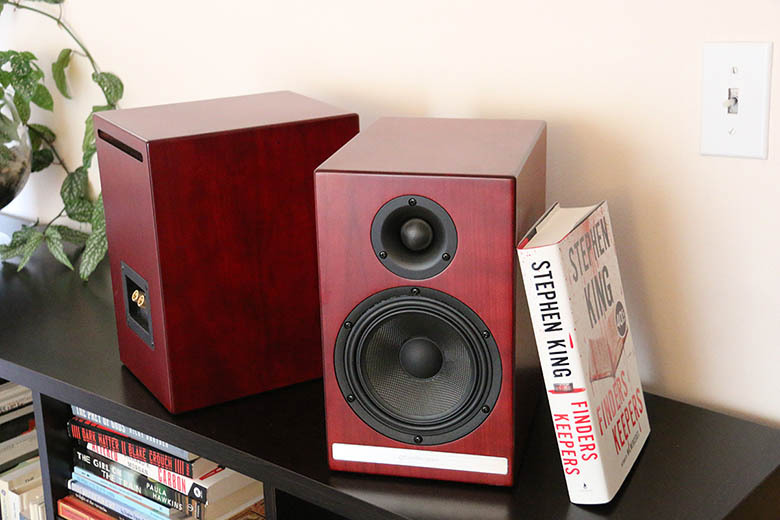 Case in point: the HDP6, a passive pair of bookshelf speakers that have become firm favorites among audiophiles. In this review, we break down the HDP6’s sound, design, packaging and accessories, specs and more. To see how it stacks up, see our list of the best bookshelf speakers. In terms of audio quality, the Audioengine HDP6 speakers sound solid, if unspectacular. They are a good, competent set of speakers, but they don’t do quite enough to force their way out of a crowded sub-$1000 speaker market. To put it another way: the design writes cheques the sound can’t quite cash - we’ll go into this in more detail below. The sound certainly wasn’t bad - far from it. There were aspects of the HDP6’s sound that we quite liked. For one thing, we really enjoyed the midrange, which showed off a good deal of definition and clarity. Elements like vocals felt rich and warm, and we really felt the speakers were complimenting the music in this particular area. With tracks that put emphasis on the vocals, like jazz or soul, the textures just leapt out at us. We also enjoyed the dynamics and the realism, both of which sounded clear and professional. These are speakers that don’t do a huge amount to color the sound, which is something we like quite a lot. There’s some solid technology at play here: the voice coils rest on an aluminum foundation, and the tweeters are cooled by ferrofluid, a liquid that becomes magnetized easily. The aforementioned bass ports help transition the low end energy outwards into the room. It’s all done with care and concern, which is why it’s a little disappointing that the audio quality doesn’t really bump the needle beyond ‘good’. Compared to models like the $499 Pioneer Elite SP-EBS73, it fights the good fight, but doesn’t strike a decisive blow. Bass was clear, with no muddiness, but didn’t feel like it gave any more definition or clarity than we might reasonably expect from a pair of bookshelf speakers. It did the job, without raising our eyebrows. We also really appreciated the soundstage. There may only be two drivers on each speaker, arranged in a fairly conventional way - nothing like the KEF EGG speakers (full review here), which have a tweeter-in-the-midrange-driver arrangement that gives them a huge sweet spot - but decent enough. There was plenty of spacing between the instruments, and while the speakers definitely have a particular sweet spot, we didn’t feel we lost a tremendous amount when moving away from it - an advantage, given that our listening space can be a little cramped and messy! If you’re interested in those KEF speakers, by the way, they cost $499 - the same as the Audioengine. They’ve got their own issues, but they’re a comparable set of speakers. If there was one element we’d really like to see improved in the HDP7 (or whatever the next version is called) it’s these. They were, again, perfectly satisfactory, but we often felt there was a little bit of detail lacking - a certain loss of crispness that we missed more than we should have. Put it this way: the HD6 (the wireless version) really impressed us - far beyond what the HDP6 has managed to do. While it’s probably unfair to compare the HDP6s to its more expensive cousin - which, after all, has a dedicated amp section - it doesn’t blow our minds when compared to other speakers in the same price range. In the time we had the HDP6s, we tested them with three amps: the PS Audio Sprout (which we stole from someone briefly), our old Yamaha YHT-1810 receiver, which functioned as a good baseline testing rig, and the Peachtree Audio nova300 (full review here). We couldn’t crank it on that last one - with a continuous power of 300 watts, the nova300 could vastly overpower the HDP6s, which have a max rating of 150 watts - but we could still get good sound of them. And we definitely think the sound was improved when matched with a comparable amp. Very obviously, the nova300 offered the finest performance - at $2,500, we’d be stunned if it didn’t, as it sounded terrific - but a model like the Sprout also made a real difference. You can get the HDP6s in three colors - brown, black or red. Ours were the latter, and many appreciative noises were made when we pulled these out the box. Although the housing doesn’t do anything revolutionary, doesn’t deviate from the basic shape of most bookshelf speakers, its construction is an immediate plus point. The smooth, crimson hardwood looks stunning, with a grain and finish that felt like it should come from something much more expensive. There’s a craftsmanship here, a quality which sets these apart from other speakers. The internal construction is rock-solid, braced, 20mm MDF, which helps minimise vibrations. Audioengine have always put out good-looking gear - we said as much when we reviewed their HD3 wireless speakers (which are $100 less than the $499 HDP6s, although not as powerful). The rest of the design matches the initial impressions. On the front end, there’s a thin metal band at the bottom of each speaker with Audioengine’s logo, and above it, a grille held in place with magnetic snaps. Removing and reattaching the grilles on each speaker is the work of moments, and although we mostly left them off (we like the naked look), the functionality and design worked hand in hand. Each speaker has a 5.5” woofer and a 1” silk dome tweeter. They are handsome black circles that complement the overall design. Around the back, there’s a thin port near the top end to help with bass definition, and a standard set of gold binding posts. The posts themselves are screw-type, and spin up easily, meaning wiring them is no problem at all. Nothing we didn’t expect to see, and nothing that isn’t done with care and quality. It’s all good. If there’s one criticism we could level at the design, it’s that it’s not going to shatter any preconceptions. It’s a bookshelf speaker. It has the same basic construction and layout as so many other speakers - just compare it to models like the Dali Zensor 1, which has a very similar shape (albeit at the cheaper price of $349). But really, it’s hard to put too much weight behind this. After all, what are we faulting here? That these speakers use a proven design that its creators know will work? No, we can’t mark it down for that, especially when there’s so much care evident in the construction and finish. Packaging here is nothing to get excited over: simple cardboard with foam inners protects things nicely. It gets the job done. And outside of the detachable grilles, the main accessory here is the felt carry case for each speaker. It’s a small thing, but we really like it. It might just be there to protect the speaker during transit, but we liked it enough to keep it around. Obviously, we aren’t going to be moving the speakers from place to place on the regular, but it’s nice to know that if we do, we can wrap them up in soft felt, pulling the drawstring shut. The design and finish of Audioengine HDP6 is lovely, with a real sense of class. The sound quality is good, if unspectacular, with solid mids and stereo imaging. ​The price of the speakers is fair, we think, and they match up well to their competitors (below). The HDP6s don’t do anything mindblowing in terms of sound. The highs, in particular, were underwhelming. There wasn’t nearly enough detail and sparkle. ​You could argue that, for $100 more, the wireless HD6s offer even better value. At a similar price, the Pioneer Elite SP-EBS73 are a good alternative to the HDP6s. While they don’t really match up in terms of design - then again, few would - they offer very comparable sound. The Coherent Source Transducer tech in the drivers results in pinpoint-accurate sound. If you are so inclined, you can swap these into a Dolby Atmos-enabled 5.1 or 7.1 setup, thanks to the driver on top of the speaker (which can be covered when not in use). That makes them a little more versatile than the HDP6s. They are also identically-priced - $499 the time of writing. With slightly clunkier design and build, the Wharfedale Diamond 220 aren’t a directly comparable option - but they are an alternative, and a cheaper one at that, which offer reasonable sound and functionality. Their cheap price (we’ve seen them at $299 for the pair on Amazon, compared to $499 for the HDP6s) makes them terrific value for money, especially considering their superb dynamic and clarity. Go for these if you don’t want to hit the near-$500 a pair of HDP6s cost. However, the best competitor and most directly relevant alternative actually comes from Audioengine’s own stable. That would be the HD6. It might cost $100 more than the HDP6 speakers, but you get huge value. This appears not only in the slightly more refined sound quality, but in the fact that they’re fully wireless. This makes them a lot more convenient. Our take? If you can, spend the extra cash. You definitely won’t regret it. But if you need a pair of passive speakers, the standard HDP6s (or any of the above alternatives) will do just fine. Come to think of it, perhaps we’re being a little too harsh on the HDP6 speakers. The design is good enough that we’d recommend these for just about any room, or any situation - good enough that even those, who didn’t know speakers, would comment on them when they spotted them in our testing room. The wood finish is remarkable, even luxurious, and it’s a big plus point. And audio-wise, while the sound quality isn’t spectacular, while it doesn’t make us want to invent a new religion and wander around barefoot extolling the virtues of ferrofluid-cooled tweeters, there’s nothing bad about it. There are areas where it excels, like the sound stage and those wonderful mids, and where it doesn’t, it turns in a solid if unremarkable performance. We think they’re pretty fairly-priced, too. At $499 for the pair on Amazon (the satin black version, bizarrely, can be had for $498.98 - we don’t know why), the price doesn’t raise eyebrows. It feels fair - although we want to go on record and say that, if Audioengine ever decide to drop the price by a hundred bucks or so, these will become a real bargain. So bottom line? 8/10. A solid B+. These are perfectly good speakers that sit right in the middle of the road, doing a good job, and which should satisfy anybody looking for speakers that provide solid day-to-day use. While it would be good to see Audioengine pushing the envelope in the same way that they do with their superlative wireless speakers, these are just fine.